By inheritance in the sitter’s family. E.P. Bowron, Pompeo Batoni A Complete Catalogue of his Paintings, The Museum of Fine Arts, Houston, 2016, vol. I p.318, no.259, illus. K. Chrisman-Campbell, in The Elegant Man. From Van Dyck to Boldini, catalogue of the exhibition ed. by M. Voena, London 2018, pp. 50-51. Milan, Palazzo Kiton, The Elegant Man, April 2018. Nathaniel Dance remarked of this portrait in a letter to his father in 1762: ‘Pompeo has made one of the best heads he ever painted’ (Dance letters MSS, 7 July 1762, Library of the Royal Institute of British Architects). This engaging portrait of George Craster exemplifies Batoni’s talents as a draughtsman and a colourist, as well as his ability to capture the physiognomy of his sitters, skills which secured his reputation as the leading portraitist in Rome in the mid-eighteenth century. Indeed, for nearly half a century he recorded the visits of international travellers on the Grand Tour in portraits that remain among: ‘the most remarkable artistic achievements of the period’ (E.P. Bowron, Oxford Art Online). Born in 1734, George Craster was the son of John Craster, a successful London lawyer with estates in Northumberland and Durham, and his wife Catherine Villiers, a descendant of the notorious 1st Duke of Buckingham. He commissioned this portrait from Batoni when he was in Rome in 1762 with his wife Olive, whose portrait in turn was painted by Nathaniel Dance, then working in Batoni’s studio. The couple had been prevented from taking a honeymoon on the continent at the time of their marriage in 1757 due to the Seven Years’ War (1756-1763). On Olive’s mother’s death in 1760, however, with the war still waging, they set out on their Grand Tour, spending the winter in the popular spa town of Montpellier. The greater part of 1761 was spent in the south of France, visiting Bordeaux, Aix and Marseilles, from where they took the sea route to Naples, arriving in January 1762. By June they were staying at the Ville de Londres in Rome, being conducted around the city by the well-known painter and cicerone, James Russel. Olive kept notebooks and (mostly undated) accounts, which include payments for artificial flowers, sheet music, pins, snuffboxes, cameos and essences, as well as two lapdogs. An entry under ‘at Rome, Antiques & Curiosities’ records: ‘two portraits of C - & self by Sig.ie Batoni & Mr. Dance - 61 scudi 5 pol [paoli]’, with copies in miniature by a Sig.ra Tibaldi [presumably Maria Felice Tibaldi, or one of her sisters] at 32 scudi and 8 paoli (a scudo, it is noted, being worth 5 English shillings). An officer with the Horse Grenadier Guards, George Craster is shown in full regimentals, which he may even have brought with him for the express purpose of having his portrait painted by Batoni in Rome. 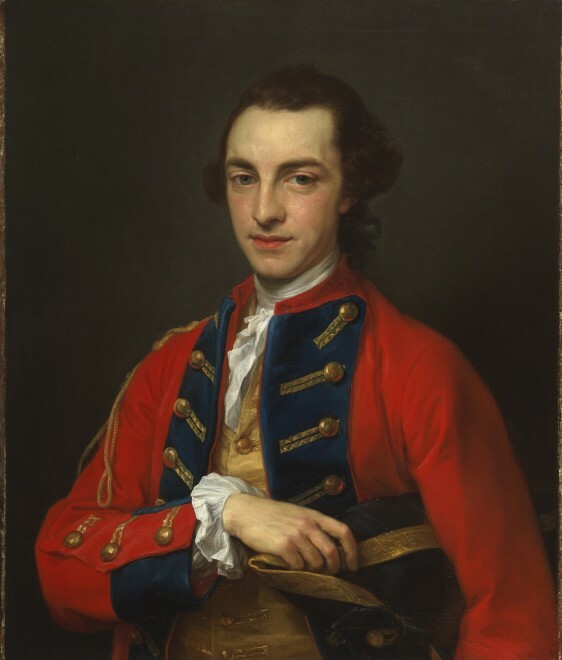 The skilful rendering of the striking scarlet uniform, with blue lapels and gold frogging, highlights Batoni’s mastery at capturing different textures and his gifts as a colourist, note the red highlights in the gold buttons reflecting from the coat. Batoni was aware that English canvas sizes differed from those in general use in Rome, and from the late-1750s onwards understood that many of his clients wished to have pictures that conformed to the standard 30 by 25 in. format, as is the case here. The Crasters travelled on to Florence, Venice, Milan and Turin, before returning over the Mont Cenis Pass into France, eventually arriving back in England in the summer of 1763. On his father’s death later that year, George inherited Craster and Dunstan Hill, Shoreswood and the principal Durham farms, being his parents’ only surviving of five children. The couple set about renovating and extending Craster, adding a new five-bay classical front to the medieval tower, inspired by the villas they had seen on the Brenta, however, Olive died in Paris in 1769, shortly before the work was completed in 1770. When George died without issue in 1772 he was succeeded by his cousin, Daniel Craster. The artwork described above is subject to changes in availability and price without prior notice. Where applicable ARR will be added.